* This is my article in BusinessWorld last November 21, 2017. During the ASEAN Summit + Related Summits in Manila, trade and the further deepening of economic integration was among the major topics. There were new initiatives as well as updates to existing negotiations at multilateral and bilateral free trade agreements (FTAs). 1. “ASEAN, HK sign free trade, investment deals” — the ASEAN-Hong Kong FTA (AHKFTA) and ASEAN-Hong Kong Investment Agreement (AHKIA). 2. “Do you know your TPPs from your RCEPs, NAFTAs and OBORs?” — about the Asia Pacific Economic Cooperation (APEC), Trans-Pacific Partnership (TPP), Regional Economic Comprehensive Partnership (RCEP), One Belt One Road initiative (OBOR), North America FTA (NAFTA). 3. “ASEAN claims ‘significant progress’ on RCEP” — mentioned the ASEAN Seamless Trade Facilitation Indicators (ASTFI), ASEAN Inclusive Business Framework (AIBF), others. 4. “US agrees to explore FTA with Philippines” — to be called the US-Philippines Trade and Investment Framework Agreement (TIFA). There are always gains/winners and pains/losers the same way that there are gains and pains under protectionism. When people withdraw their savings for several months in exchange for a new car or dream vacation, they derive net gains from trade of savings vs. vacation. ASEAN is known for its fast pace of tariff liberalization towards zero compared to many other economic blocs in the world. That’s the good news. The bad news is the big increase in non-tariff barriers (NTBs) or non-tariff measures (NTMs). These are restrictions and barriers other than tariffs and taxes that make imports or exports of products more difficult, more complicated and hence, more costly (see table). 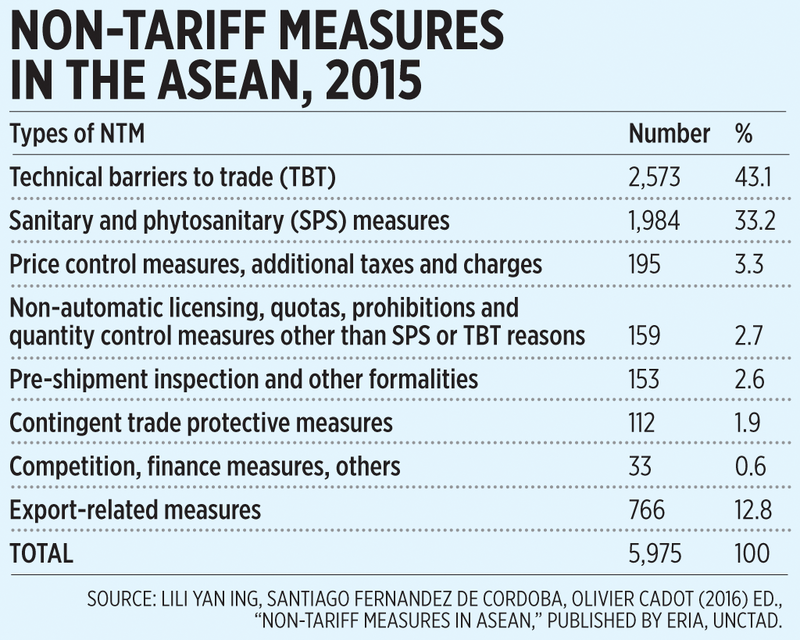 Among ASEAN member-states, Thailand has the highest number of NTMs at 1,630, 2nd was the Philippines with 854, 3rd was Malaysia with 713, 4th was Indonesia with 638, 5th was Singapore with 529, 6th Brunei with 516, 7th Vietnam with 379, 8th Laos with 301, 9th Cambodia with 243, and 10th was Myanmar with only 172. 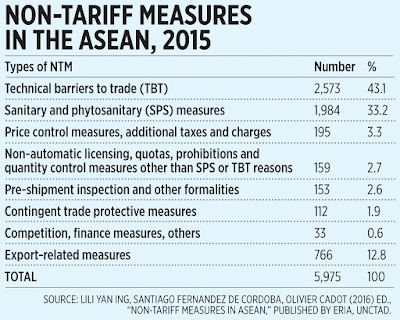 The most common NTMs in Thailand and Myanmar was sanitary and Phytosanitary (SPS) measures while for the other eight ASEAN countries, technical barriers to trade (TBT) was most common. So which way to achieve regional if not global free trade: (a) Multilateral via World Trade Organization (WTO), APEC, TPP, RCEP, AEC, others ; or (b) bilateral like US-Philippines TIFA, Japan-Philippines Economic Partnership Agreement (JPEPA)? The advantage of multilateral liberalization is that all economies in the world or at least in the region are committed to bring down their tariffs and NTMs. The disadvantage is that under WTO, real liberalization remains far off even after 22 years (1995 to present) of numerous negotiations. The setback of regional FTAs is that while member-countries can have near-zero tariff and reduced NTMs, other countries outside the FTA are slapped with high tariffs and/or multiple NTMs. The advantage of bilateral liberalization is that differences and disputes can be ironed out easier and faster so that FTA can materialize soon. The disadvantage is that a country will need to dispatch plenty of trade negotiation teams to deal with many countries and hence, it can be costly and messy. A third way is via unilateral liberalization. Just bring down the tariffs and NTMs, open up the borders with little or no conditions. The main advantage of this move is that it can be done quickly with very little trade negotiation teams and hence, non-costly to taxpayers. However, the disadvantage is that it is “too scary, too radical” for many people as it might result in massive labor displacements. There are a few countries that boldly took unilateral liberalization and so far, almost all of them have attained economic prosperity in just a few decades such as Hong Kong, Singapore, Dubai/UAE, Chile. Unilateral liberalization in goods has been done by the ASEAN as a bloc. The challenge is unilateral liberalization in services. With continued modernization in the information and communications technology worldwide, it is much easier, not harder, to liberalize trade in services. Asian economies, the Philippines in particular, should consider a unilateral liberalization policy. This would involve fewer trade bureaucracies, taxes and subsidies, and more competition from more suppliers and manufacturers from countries around the world. Local consumers will benefit from more choices and more options while shelling out less taxes and fees. * This is my article in BusinessWorld last November 16, 2017. Among the global leaders who attended the ASEAN Summit 2017 this week in Manila were the leaders of the US, China, Russia, Australia, and India. These five countries are also the top five in having the world’s biggest coal reserves and top five biggest coal producers. US President Trump in particular emphasized his desire for “reciprocal trade” with Asian countries. Energy trading is a growing sector in the US as it is now the world’s biggest oil and natural gas producer (overtaking Saudi Arabia and Russia in oil and gas output, respectively, since 2014) but not yet the world’s biggest exporter of these two commodities. The subject of Trump’s energy policies was well-discussed by many scholars, researchers, and some players during the “America First Energy Conference” in JW Marriott Houston, Texas last Nov. 9, organized by the Heartland Institute and co-sponsored by many other US-based independent think tanks and research institutes. I attended that meeting and it seems I was the only Asian in the big conference hall. I went there from a different perspective compared to American participants — to further understand how the evolving US climate and energy policies would impact Asia in the short to long-term, the Philippines in particular. In his breakfast plenary lecture, Joe Leimkuhler, VP for drilling of LLOG, a deepwater exploration company, discussed whether the US can dominate energy as articulated by President Trump. a. Oil, natural gas — The US can have energy dominance in the short-term but to make it long-term, the shale revolution should be sustained and supported, and if more gas reserves are discovered. b. Coal — Supplies can meet domestic demand but may be unable to provide for short-term exports. There are no coal exporting facilities on the West Coast to cater to the biggest coal customers in the world, Asia. The states of Washington, Oregon, and California have passed laws preventing the construction of such facilities or delaying the permits. US coal is cheaper to produce and its quality is higher than other suppliers can give. Many sessions in the conference provided extra information about the current weaknesses of the US coal industry despite its huge reserves. In the session on “Peace Dividend: Benefits of Ending the War on Fossil Fuels,” Dr. Paul Driessen, Senior Fellow at the Committee For A Constructive Tomorrow (CFACT), showed these data on electricity prices, 2017, in US cents/kWh: (a) Germany: residential 35, business and industry 18; (b) California: residential 19, business/commercial 18, industry 14.5; (c) Indiana-Kentucky-Virginia average: residential 11.7, commercial 9.5, industry 6.5. Germany, Denmark, South Australia and California have the highest concentration of wind-solar farms and they have the most expensive electricity prices in the planet. The US has the largest coal reserves in the world estimated at 381-year supply, shown in the Reserves/Production (R/P) ratio. Russia has the highest R/P ratio because its production and consumption is smaller compared to the US. China has the second biggest reserves but its R/P ratio is small because of its huge production and consumption in million tons oil equivalent (MTOE). In 2016, half of global coal consumption was made in China alone (see table). Once the US can build those coal export facilities in the West Coast and various anti-coal policies in the Clean Power Plan (CPP) and CO2 Endangerment Findings are finally reversed, Asia will have more options of cheaper and higher-quality coal, aside from what they currently get from Australia, Russia, Indonesia, South Africa, and others. The Philippines is a small player in the global coal market — very small reserves, negligible production (mostly from Semirara), and meager consumption. Yet many environmentalists seek to further restrict, if not actually prohibit Philippine coal power plants and force us to depend on undependable, unstable, unreliable, erratic, intermittent, and expensive wind-solar energy. Governments should not pick winners and losers via legislation and multiple regulations, taxation, and selected subsidies. They should allow consumers to realize higher consumer surplus via competition and more choices in energy sources that are cheaper, stable, predictable, and dispatchable. Many if not all politicians and "planet saviours" from developed countries during the UN COP meeting in 2009 or so were dishonest when they pledged that their countries will give $100B/year to developing countries starting 2020. Now the latter are asking, "where's our money? Oodles of money?" And they demand further this week, "More money on top of $100B/year." No wonder Al Gore, the UN, WWF, etc. are so passionate to "save the planet". $100B/year is not enough, $5.7 trillion/year is the high target. Climate Tricks 62, Climate religionism of Arcy Garcia, July 02, 2017. * This is my article in BusinessWorld last November 10, 2017. Is there a connection between tourism and the travel time to and from the international airport and the city proper? I asked myself this question while I was reading Eva Air’s inflight magazine en route to Houston, Texas. I spent a total of 17 hours traveling — two hours from Manila to Taiwan, a layover of one hour, and another 14 hours from Taiwan to Houston. The good news is that all three airports mentioned have free Wi-Fi, especially in Taiwan, which offers fast Internet connections without requiring registrations. 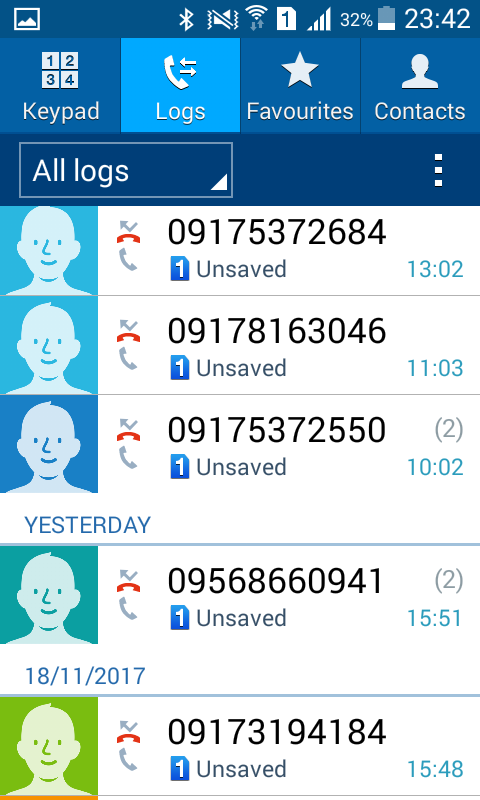 The bad news is that free Wi-Fi does not reach some gates at the NAIA. I paid a visit to Houston to attend the “America First Energy Conference,” set for Nov. 9 at JW Marriott Houston, sponsored by the Heartland Institute, which also provided me a travel scholarship. 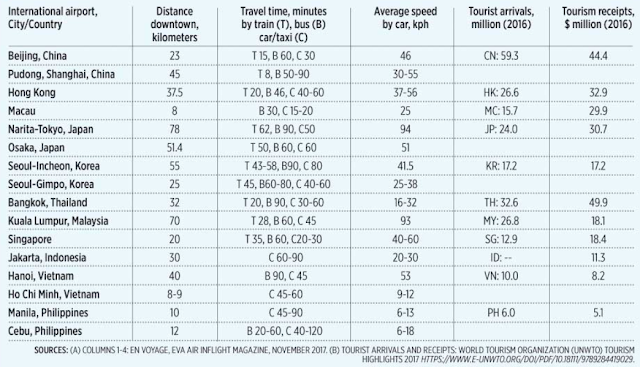 The airline’s En Voyage inflight magazine has one table that shows the list of the global airports they serve, distance from airport to downtown, the estimated travel time by train, bus and car/taxi (C), and cost in local currencies. 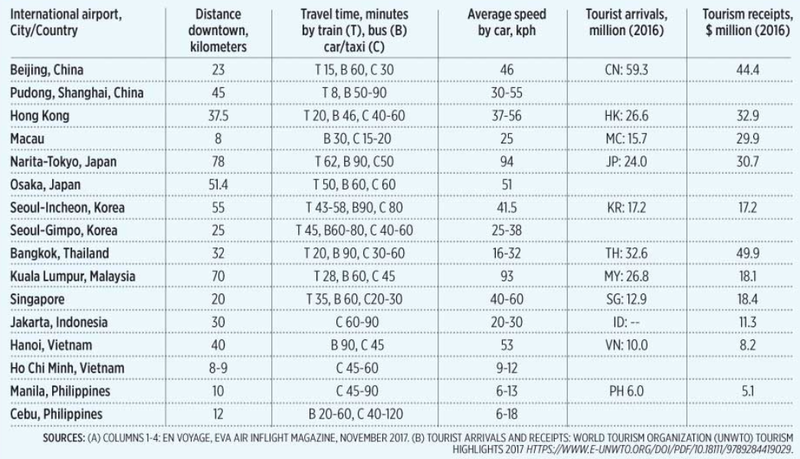 I reconstructed the table and chose only major cities in East Asia, computed the average speed by car/taxi travel, then added data on each country’s international tourist arrivals and tourism receipts in 2016 (see table). 1. Economies that have quick and convenient transport systems between their airports and city centers have higher tourism arrivals, even if their airports are far away from the cities. These examples include: China, Hong Kong, Japan, Malaysia, Thailand, South Korea, and Singapore. 2. Airports near their city centers have fewer visitors, if transport systems between locations are slow. These examples include: Vietnam (especially Ho Chi Minh airport) and Philippines, both NAIA/Manila and Mactan-Cebu airports. There are many factors of course why some countries have very high tourist arrivals while others have fewer visitors. These factors are convenience of the airport itself, overall peace and order situation of the country, dominance of the rule of law, proximity of that city/country to other important tourism areas in other cities and countries. If one lands in Bangkok, one can go to Cambodia, Laos, and Vietnam by land, without the need to take other flights. Preliminary data show that yes, there seems to have a positive connection or correlation between fast airport transfer and tourism arrivals. The data on Manila airport is a bit outdated because (1) there are now convenient and fast bus transportaion from NAIA/Manila airport to city centers of Makati City, Pasay City, and Manila and vice-versa, and (b) newly opened NAIA Expressway (PPP project by San Miguel) has significantly cut the travel time by car from the airport’s three terminals to city centers. Some implications for the Philippines and its infrastructure and tourism policies. One, NAIAEx tollway is doing good and should contribute to attracting more visitors into the country; thus, further extension of this tollway to BGC and other areas as planned by the project proponents and O&M operators should be facilitated by the government and not subjected to various cumbersome and costly regulations and permitting procedures. Two, moving the Philippine international airport to a farther but bigger space (Clark in Pampanga, or Sangley Point in Cavite, or currently rice lands in Bulacan, etc.) complemented by fast train and/or buses to city centers will be a win-win situation. Three, allow more integrated PPP (builders and O&M operation functions are assigned to only one winning bid player or consortium of players) for big, new airports, not hybrid PPP. Until middle of this month, there was still hope of a possible “Jamaica coalition” in Germany – Black flag by CDU-CSU, Yellow by FDP and Green by the Greens. I posted these thoughts and news liniks from November 18-20, 2017 in my fb wall, reposting them here. Before, Merkel and CDU/CSU were chummy-chummy with Obama in the anti-coal, "save the planet" drama. Then pro-coal, climate realist parties AfD and FDP surged high in the Bundestag elections last Sept, CDU and SDP suffered big time. 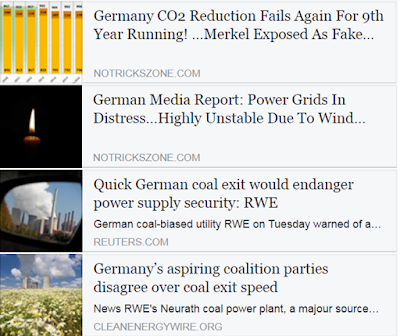 Now Merkel perhaps realizes that Trump is correct in allowing more coal power for highly-industrialized economies like Germany so Merkel won't give in to the Greens' blackmail of closing all coal plants just to have a coalition govt with them. The danger -- a collapse in negotiation would mean new elections. The FDP and the Greens are also at opposing ends over the so-called solidarity tax, a 5.5 percent tax on incomes, capitals and companies. The end of the tax is a core FDP demand, which the Greens reject." -- from the EU observer article, Nov. 17, 2017. Meanwhile, this is fake news from The Guardian “German Greens drop car and coal policies in coalition talks with Merkel”, Nov. 8, 2017. “It is clear to me that we will not be able to enforce a ban on internal combustion engines by 2030,” the Greens’ co-leader Cem Özdemir told Stuttgarter Zeitung. The Greens are also prepared to modify their demand that the 20 most polluting coal-fired power plants in Germany should be shut by 2020." The Greens are outright watermelons, green outside, red inside. Many watermelons and frequent climate junketeers and jetsetters are angry that Trump is not giving them more money for the expensive, thousands participants annual UN FCCC meeting, this year held in Bonn, Germany. Now the watermelons are extra angry that Merkel won't give in to their demands that Germany should close down many of its coal power plants. "Germany's Merkel dodges coal deadline at climate talks", Nov. 15, 2017. "Germany generates about 40 percent of its electricity from coal, including the light brown variety called lignite that's considered to be among the most heavily polluting fossil fuels. "Coal, especially lignite, must contribute a significant part to achieving these goals," Merkel said. "But what exactly that will be is something we will discuss very precisely in the coming days." The watermelons are a big bunch of hypocrites. 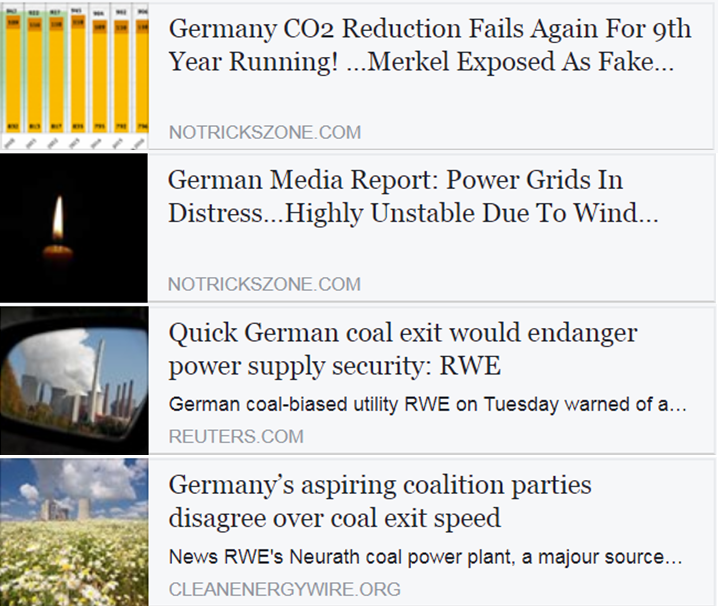 They lambast coal yet super-enjoy Germany's industrialization and its 24/7 electricity, 40% of which is from coal power. They also lambast other fossil fuel like oil yet they jetset by the thousands from many countries and cities, their airplanes and cars using oil, not water or solar. Macron is less hypocrite when he lambasts coal because France is largely dependent on nuke power that produces about 75% of its total electricity supply. Next to Germany in having big coal power supply is Poland, which will host the UN FCCC 2018 meeting. 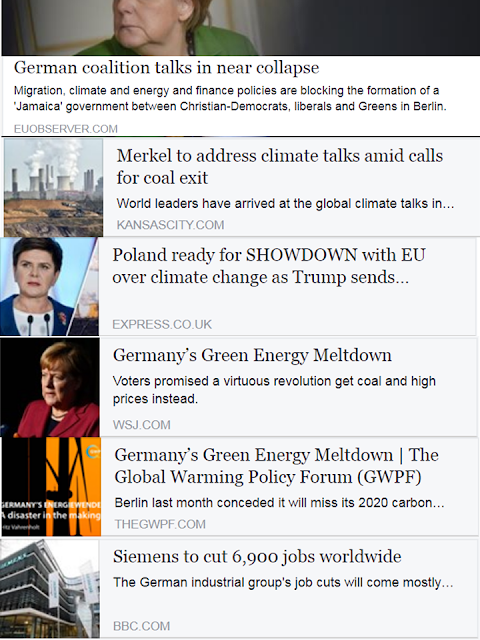 "Poland ready for SHOWDOWN with EU over climate change as Trump sends 74,000 tonnes of coal", Nov. 16, 2017. "Prime Minister Beata Szydło has warned MEPs she will "throw it back at them" if they criticise her nation's carbon consumption at next month's EU summit. The ruling Law and Justice party are unapologetically pro-mining, a belief shared by US President Donald Trump, who visited the country in the summer and said: "Whenever you need energy, just give us a call." "Mrs. Merkel’s failure comes despite astronomical costs. By one estimate, businesses and households paid an extra €125 billion in increased electricity bills between 2000 and 2015 to subsidize renewables, on top of billions more in other handouts. Germans join Danes in paying the highest household electricity rates in Europe, and German companies pay near the top among industrial users. This is a big reason Mrs. Merkel underperformed in September’s election. "At the 17-minute mark, Bernd Benser of GridLab-Berlin tells viewers that while grid operator Tennet had to intervene only 3 times in 2002 to avert grid instability, last year he says the number was “over 1000” times — or “three times daily”. "Chief financial officer Markus Krebber said such a unilateral move by Germany, which had just contributed to making a pan-European CO2 trading mechanisms much stricter, would harm the economy and undermine the security of supply. * This is my article in BusinessWorld last November 6, 2017. The Philippine Economic Society (PES) annual conference is probably the most cerebral event in the field of economics and business in the country. The reason is that in the afternoon, there are eight simultaneous panel discussions on eight different topics within 1 ½ hours, each panel with 3-4 presenters giving technical papers. A coffee break then another 7-8 simultaneous panel discussions, a total of 15-16 different topics with a total of about 50 speakers and panelists, in just one afternoon. The morning session is devoted to big personalities in government (Cabinet Secretaries, Congress leaders), multilaterals, and sometimes corporate leaders. Except on few cases, I don’t give these speakers much weight because their presentations are generally presented and discussed somewhere else and in media. So I became a lifetime member of PES and I have attended all the past PES annual conferences in the past decade or more. The next PES annual conference will be this coming Wednesday, Nov. 8 at Novotel Hotel in Cubao, Quezon City. This year’s theme is “Growing Amidst Risk and Uncertainty.” I have developed skepticism to subjects with generally pessimistic or alarmist titles so I checked certain numbers to see if indeed there are more economic and social risks and uncertainties now and the near future, both global and national, compared to the past few years. (1) Projected gross domestic product (GDP) growth among the world’s biggest economies US, Canada, Germany and Japan are faster than the last four years. 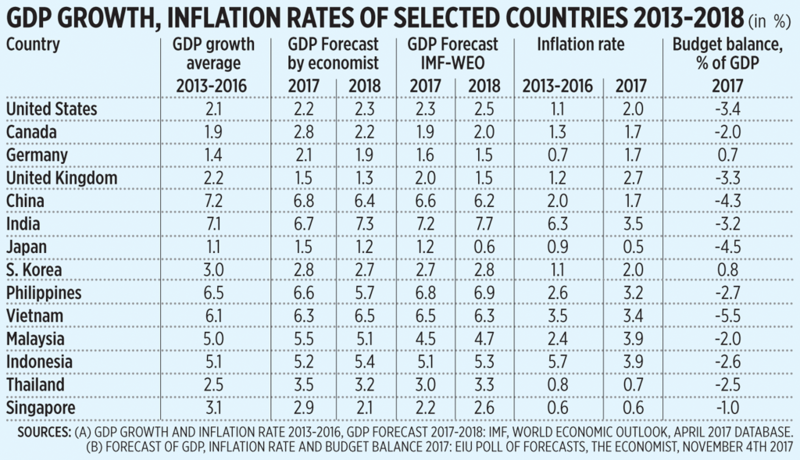 There is projected growth slowdown in China and India, the world’s #1 and #3 biggest economies in GDP-PPP values but the rates are still high at nearly 7%. In the ASEAN-6, the same pattern of higher growth this year and the next compared to the past four years except in Singapore. (2) In consumer prices, projections for 2017 are higher than the last four years for the industrialized west but the uptick is not scary nor alarming. For Asia’s big economies, either there is projected decline or the rise will be mild. For the Philippines, note that The Economist/EIU pool of forecasters project a crack in growth momentum next year. The past Aquino administration has managed to post really strong growth compared to many countries in the planet, growth momentum until this year but expected to somehow crack starting 2018. Sadly, I cannot attend the PES meeting this year because I am going to the US for another conference this week and hence, first time in many years that I will miss this big event. If I could attend, of the 15 different topics in the afternoon, I would attend the Energy Policy Development Program (EPDP) panel on “Power Economics: Prices, Generation and Use” or Trade topic in session A. In session B, I would attend the Friedrich Naumann Foundation for Freedom (FNF) panel on “Climate Change and the Economics of Natural Disaster” or Ateneo School of Government (ASoG)’s panel on infrastructure. I have written a number of papers in this column on the merits of cheaper, stable energy from conventional sources and the lousiness of unstable, intermittent, expensive renewables that depend on subsidies and priority dispatch to make them “viable.” In Germany, there is a growing momentum of policy reversal in climate and energy policies because the German liberals Free Democratic Party (FDP) and politically wild Alternatives for Germany (AfD) have surged high in the recent Bundestag/Parliament elections last September and these two parties are very explicit in questioning continued renewables cronyism and endorsing cheaper, stable energy from coal. To summarize: (a) There are less risks and uncertainties now and the near future compared to recent years; (b) Endless fiscal irresponsibility by governments will create long-term risks with rising public debt; (c) Dutertenomics of tax-tax-tax aside from kill-kill-kill in its drugs war may crack starting next year; and (d) Climate and renewables alarmism will see slow policy reversals in more countries soon. 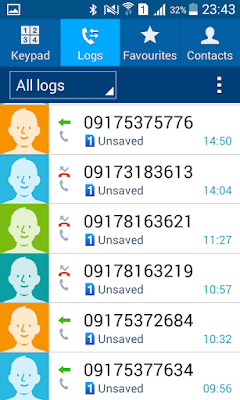 Last Saturday, November 18, my cell phone has been getting anonymous calls. I thought they were from some friends but when I answered the call, the caller/s would not speak. I replied by text to some numbers, "Who is this please, thank you", no reply, deadma. 1. Marketing warriors trying to sell me something. 2. Duterte warriors who love my criticism of the President. 3. Climate warriors who want to "save the planet" and unhappy with those who question their religion. 4. Others, as joked by some friends: (a) BBC trying to interview me (a joke in reference to a Du30 fanatic blogger Sass Sassot who got angry at BBC because they never interviewed her), (b) they are my silent admirers, etc. #1 is not possible because marketing people quickly speak when their call is picked up. #s 2 and 3 are possible. 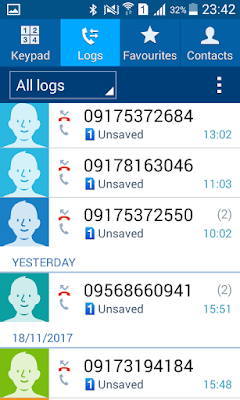 Here are the screen shots, arranged from latest to earliest calls. "Today" refers to yesterday, Monday, I took the shots at 11:42pm. 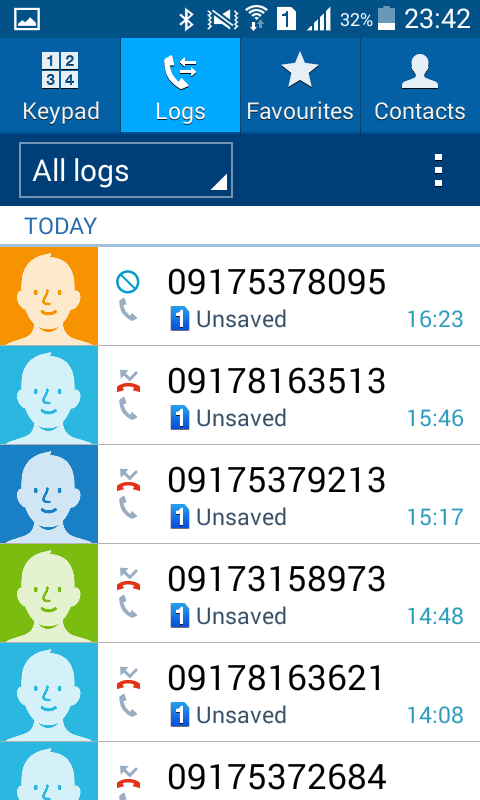 So there, I don't know who these trolls are but I ignore their calls. 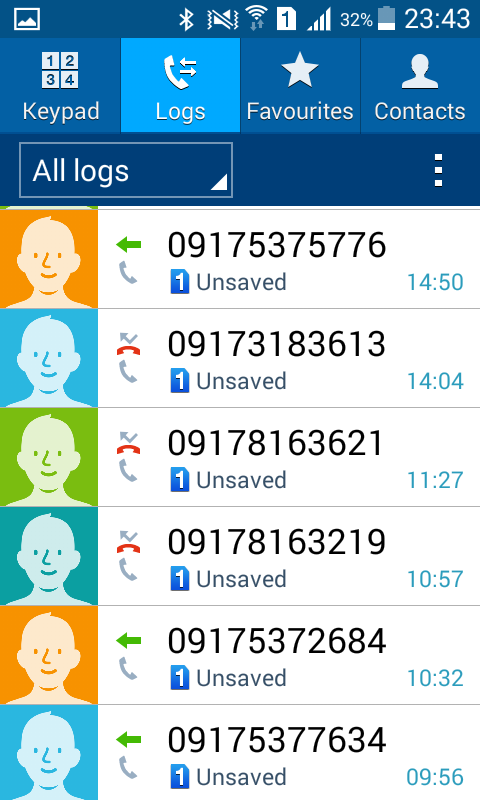 I will also report this to DICT and Sec. Eli Rio, Jr.
* This is my article in BusinessWorld last October 31, 2017. Energy means development. It is not possible to have fast growth in all sectors — agriculture, manufacturing and services — and sustain it without ample supply of affordable and stable energy and electricity. The US remains the world’s biggest economy in terms of nominal or current values of gross domestic product (GDP). But in purchasing power parity (PPP) valuation of GDP, China has tied the US economic size in 2013, both with $16.7 trillion, and in 2014, China ($18.2T) overtook the US ($17.4T). The energy policies of the previous administration can be summarized as follows: (1) drastic reduction of coal use, (2) steady use and consumption of nuclear and hydroelectricity, (3) relative encouragement of natural gas and oil, and (4) massive support and subsidies for variable renewable energies (VREs) especially wind-solar. Germany: (1) mild reduction in coal, oil and nuclear, (2) relative encouragement of natural gas, and (3) massive support and subsidies for VREs. Japan: (1) increased use of coal and natural gas, (2) decreased use of oil and nuclear, and (3) big support for solar. China and India: uniform increase in coal, oil, natural gas and VRE. Which is the right thing to do, to improve energy capacity as big and as stable as possible to hasten their economic development (see table). 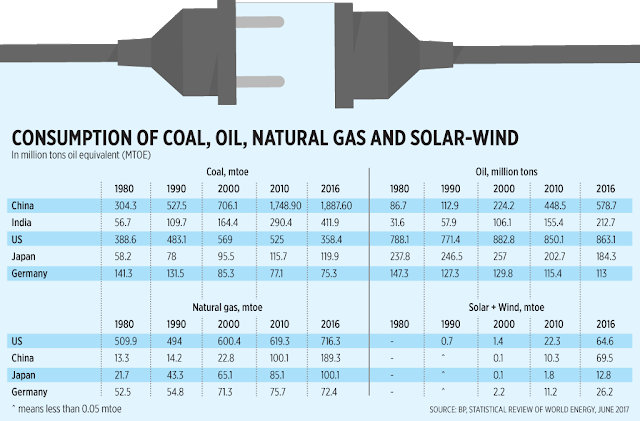 The US energy transition from coal to VREs like wind-solar has affected its long-term energy stability and competitiveness and punch some holes on the budget and ordinary consumers’ pockets. (1) Appointed an Anthropogenic global warming (AGW) skeptic, Scott Pruitt as head of the Environmental Protection Agency (EPA). EPA in the previous administration has issued lots of regulations that explicitly or implicitly restrict new coal power plants while putting existing coal plants. (2) Issued America Energy Independence policy in March 2017, targeting to reverse among others, the Clean Power Plan (CPP) projected to cost the US economy up to $39 billion a year and increase electricity prices in 41 States by at least 10%. A follow up Executive Order (EO) “Implementing an America-First Offshore Energy Strategy” was issued in April 2017. (3) Exit from the Paris Agreement and the multi-trillion dollars possible liabilities in legal and environmental challenges. These policies will reverberate to Asia and the rest of the world in terms of higher US production of coal, oil and gas. Higher supply means lower or stable prices for these energy sources. 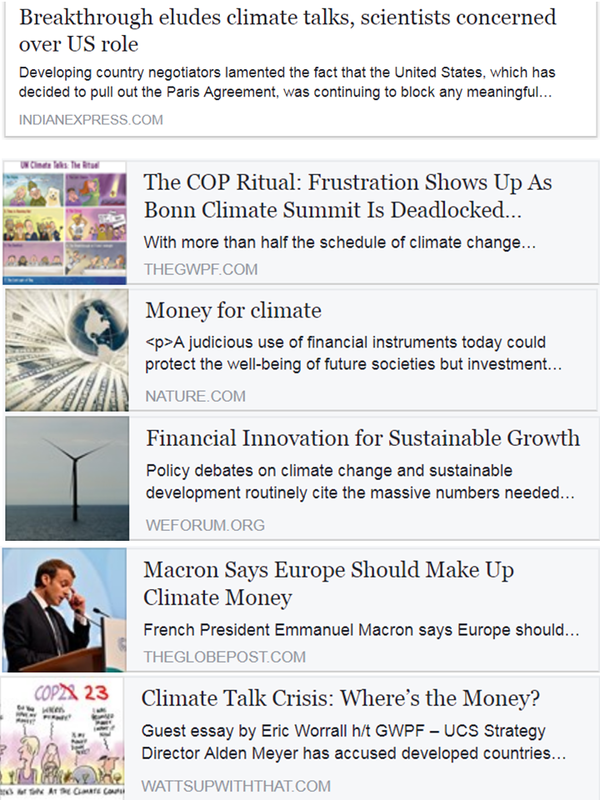 On a related note, an America First Energy Conference (http://americafirstenergy.org/) will be held in Houston, Texas this coming Nov. 9, to be sponsored by the Heartland Institute. Being organized by an NGO, speakers and moderators (41 so far) are all from nongovernment entities except one, from the US Department of Interior. Last week, the International Energy Agency (IEA) reported that about 100 GW of new coal-fired power generation capacity is expected to come online in SEA alone by 2040, increasing the region’s installed capacity to about 160 GW and more than doubling the region’s current coal power capacity. Global coal-fired generation capacity to grow by nearly 50% over today’s levels. Coal as fuel is preferred because it is cheaper than natural gas and coal plants are in many cases less costly than the capex needs of gas plants, the IEA admits. The Philippines will be among the big SEA nations that is investing big amount of resources in expanding its coal capacity. And rightly so. In 2016, coal constituted 34% of PH total installed power capacity but contributed 48% of actual electricity production. Cheap, stable, and dispatchable electricity upon demand, that is the kind of power sources that people the developing world need. Governments must step back from climate and renewables alarmism and cronyism and go for least-cost, reliable energy. A friend, Ateneo de Manila's Economics Professor, Ser Pena-Reyes, posted this chart from Rappler in his fb wall yesterday. I like it. 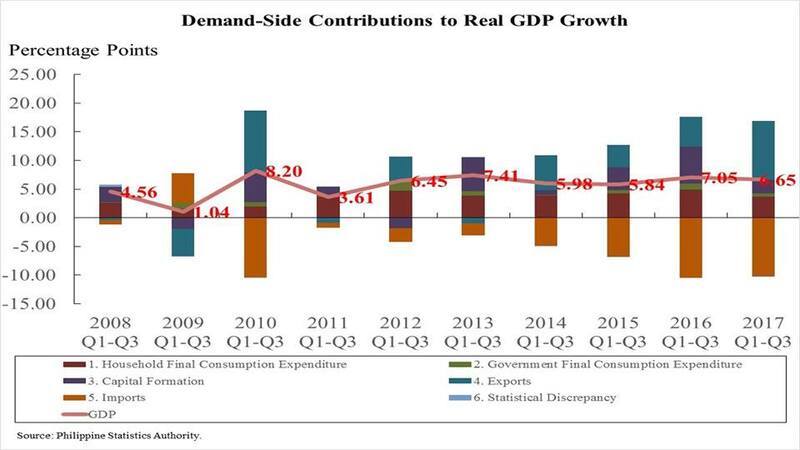 My immediate reaction -- see in the Expenditures side, Q3 2016 vs Q3 2017, Household consumption is declining this year while Government consumption is rising fast. The Du30 government is spending big time this year, funded by lots of borrowings, to be followed by tax-tax-tax in 2018 and beyond. Magaleeeng. 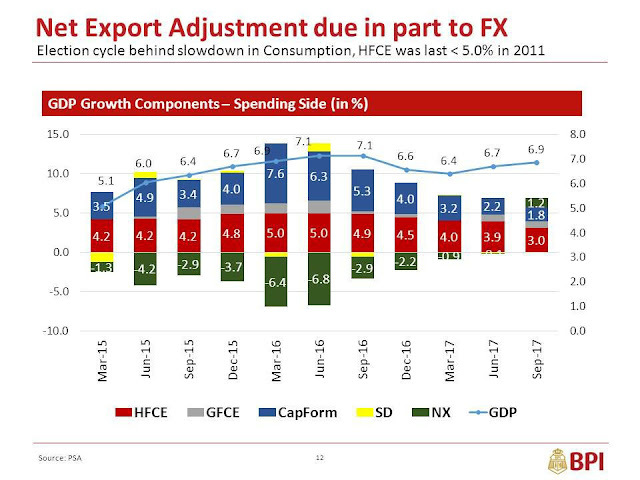 Another economist friend, Jun Neri, BPI's chief economist, posted their chart analysis of the Q3 growth, their version on the spending side. Jun said "It factors in the weight of each sector. 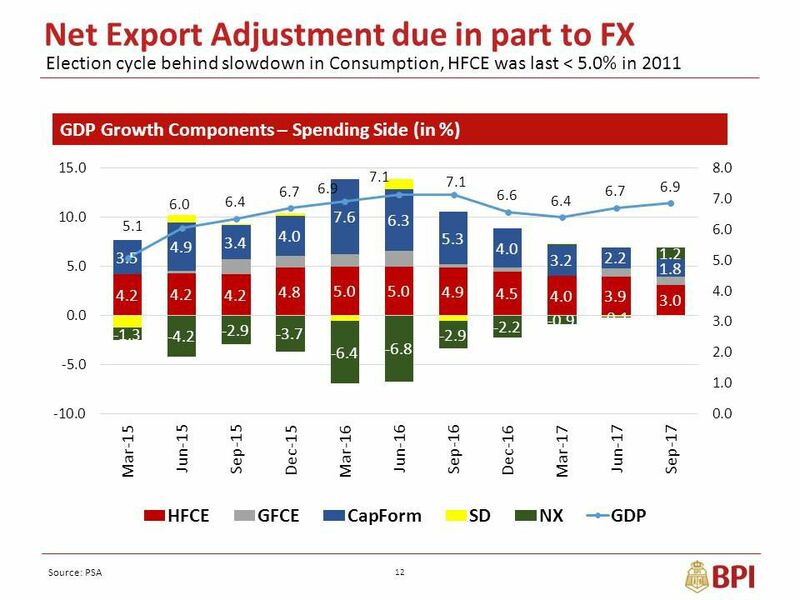 Notice how Net Exports (X - M) helped compensate for the slowdown in HFCE (household consumption)." Good chart, Jun/BPI. Ser made another chart, below, on the demand side of the GDP growth. Ser noted that "HFCE, GFCE, and capital formation appear to be the main drivers of the deceleration—an observation that raises some concern regarding growth sustainability. There is a need to accelerate capital formation in particular, if we are to shift from consumption-led to investment-led growth." Growthwise, the slow growth in year 1 of PNoy Aquino government was momentum from the lousy Gloria Arroyo economy. Likewise, the fast growth in year 1 of the Du30 administration is momentum from PNoy fast growth era. Besides, while PNoy budget deficit was around P300 B/yr or less, Du30 deficit in year 1, this year, is p600B+. No crisis year yet it borrowed heavily, hence the high jump in Government consumption growth. Fiscal responsibility means in financial turmoil or crisis years, government borrows big time to help propel an economy then have fiscal surplus in non crisis years to pay some debt. This administration displays big time fiscal irresponsibility of spend-spend-spend, ramp up the deficit and borrowings in non crisis, already fast growth period. * This is my article in BusinessWorld on October 27, 2017. Open pit mining (OPM) is not as scary and draconian as many activists would paint it to be. Thus the ban on OPM by the CA-rejected ex-DENR secretary Gina Lopez has little or zero technical basis, only emotional outburst. The Mining Industry Coordinating Council (MICC), the multi-stakeholder body on the sector has finally decided that the ban on OPM should be abandoned and new DENR Secretary Roy Cimatu has said that he will soon issue a new department order for this. Now that the uncertainty of OPM banning has been removed, existing mines should be able to continue their production without fear of policy reversals. The image of the country as having fickle, atras-abante investment policies should be somehow corrected. New, big prospective mining projects in the Philippines will hopefully see the green light for their operations. 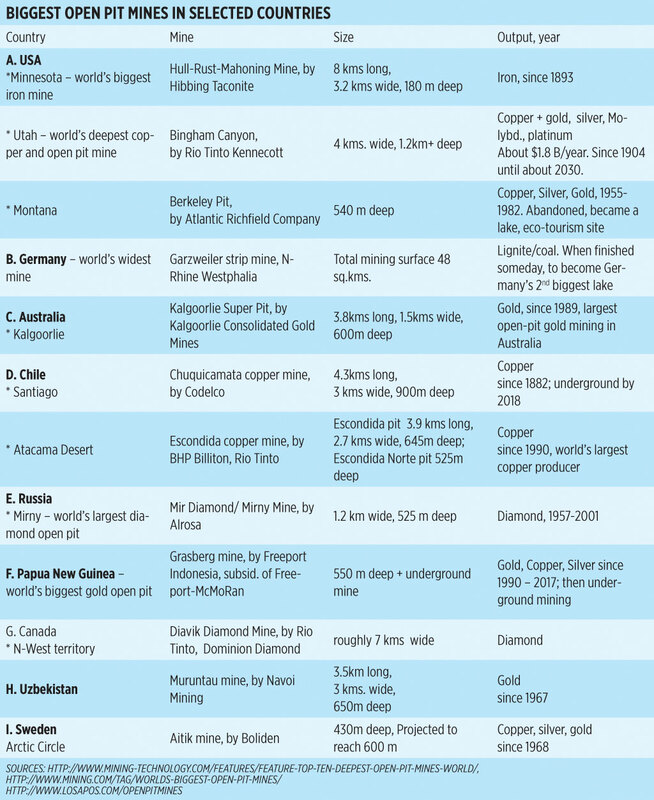 Two of those big potential projects are (1) the $2-billion MVP-led Silangan gold mine in Surigao del Norte, and (2) the $5.9-billion Tampakan gold-copper project in South Cotabato. The latter is actually the Philippines’ single biggest foreign investment project and is expected to bring huge income for the locals and the government, national and local. Many local anti-mining groups vehemently oppose the Tampakan project citing thousands of hectares of land that will soon be wasted. That is an outright exaggeration. The copper-gold ore extraction in just one area is projected to be about 2.5 kms. wide, 3 kms. long and about 0.8 km deep, after 17 years of operation. This is significantly smaller than the Hibbing and Bingham Canyon in the US, among other big OPMs in the world. Government should simply set the parameters and criteria for business to follow based on existing laws, like the Mining Act of 1995. Once government has given its permit and approval for a mining project, it should simply monitor the players that they comply with the laws and penalize violators, not change rules midway and in the process, violate the laws that it is bound to follow and implement in the first place. The rule of law applies not only to businesses and regulated entities but also to the government. The rule of law applies to both governors and governed, both administrators and administered, both regulators and regulated. If governors and regulators want to exempt themselves from the law and make their own instant rules, that is the rule of men with arbitrary powers circumventing the rule of law. Reposting these news stories collated by PRA, enjoy. The Chinese government has begun a campaign to protect the intellectual property rights (IPR) of foreign companies. China is in the middle of a rapid shift towards cloud technologies. Execution of the 13th Five Year Plan will deliver substantial investment into cloud computing and the sector is undergoing unprecedented growth. Meanwhile, organisations operating in this digital economy face an increasingly complex intellectual property (IP) environment, as China becomes a global IP center and scales up IP protection, enforcement and penalties for infringement. Indeed, the number of cloud-related IP lawsuits in China grew 158% between 2011 and 2016. Against this backdrop, organisations face an important question: how can they take advantage of the enormous opportunities presented by the cloud in a way that manages this complex IP landscape? In this post, Matt Pollins and Nick Beckett from CMS look at the practical steps organisations can take to protect themselves and succeed in the cloud. A major amendment in Taiwan to the regulations governing customs border measures will play a key part in protecting trademarks. The measures allow the owner of a trademark registered in Taiwan to file an application with Customs to have the trademark recorded on its database enabling Customs to seize counterfeits when it inspects imported or exported goods ex officio. The legal basis for this mechanism is rooted in the Regulations Governing Customs Measures in Protecting the Rights and Interests of Trademark, which is enacted pursuant to Paragraph 2 of Article 78 of the Trademark Act. South Korea's unification ministry on Tuesday urged the Democratic People's Republic of Korea (DPRK) not to violate property rights owned by South Korean companies which had operated factories in the currently closed inter-Korean industrial complex. Seeking to achieve a "more balanced" trade relationship, the Trump administration has pressed India on key issues like market access, lifting of trade barriers and intellectual property protection. During the first US-India bilateral Trade Policy Forum (TPF) under the Trump administration which was attended by US Trade Representative Robert Lighthizer and Union Minister of Commerce and Industry Suresh Prabhu, India strongly differed with the American position on many of the contentious issues. During a meeting in New Delhi last week, Indian Commerce & Industry Minister Suresh Prabhu announced how "extremely important" it is for India to protect intellectual property rights. Minister Prabhu noted that the Indian economy has undergone robust changes during recent decades and is now a leader in innovation and developing technologies. * This is my article in BusinessWorld last October 23, 2017. The intent or purpose of higher taxation is to further penalize an act, work, or consumption, hoping to discourage them by making their prices higher while giving government and lobbyists more freebies and more money. The unintended result of higher taxation is to encourage illicit trade, production of cheaper but lower quality goods and services while giving the corrupt and extortionists in government more money. Such may be the experience of the Sin Tax law of 2012 or RA 10351. It has raised lots of money for government, benefitted the universal health care program of DoH-PhilHealth while enriching the smugglers, illicit traders and their government protectors. Revenues from sin tax has significantly increased in 2013, the first year of implementation of the law. Tobacco tax in particular has more than doubled from P32B in 2012 to P70B in 2013. Meanwhile, estimates of cigarettes smuggling have also increased from 35 million packs in 2012 to 40 million packs in 2013 (see table). The rise in smuggling and illicit trade of cigarettes is also shown by the haul of the BoC and BIR in raids in November 2016 in Bulacan, Pampanga and Pangasinan where more than P1 billion worth of illegally produced cigarettes and counterfeits were discovered. In Pangasinan alone, an illegal factory was raided, which led to the discovery of fake stamps and cigarette making/packing machines that can produce up to 3.6B cigarettes a year. So claims by the government and advocates of RA 10351 that “8 million Filipinos have stopped smoking since the passage of the law” or “at least 70,000 smoking-related deaths have been averted since 2013” and similar pronouncements may not be true after all? Or are these numbers exaggerated? The numbers in the table and the huge number of discovered smuggled cigarettes by government raids mean one thing — demand and consumption for tobacco products remained high despite the tax hike. Consumers simply shifted from higher-price to lower-price products, and from legal to illegal or informal sources of tobacco and alcohol products. Like lambanog and tuba. They replied that they do not have the numbers but they observe that smoking and drinking incidence did not drop or decline. Poor people simply shifted to cheaper brands as new brands with cheap products like Mighty sprouted. The well-off continued patronizing the established higher-price brands despite the rise in prices, they simply reduced their smoking by several sticks a day. For alcohol products, San Miguel beer is literally wiped out in poorer villages because of its higher price but the consumption of Ginebra, Emperador, Red Horse, and other products has remained the same if not increased. Drinkers usually start with the high alcohol drinks and before going home or elsewhere, they wind down to Red Horse. Sen. Manny Pacquiao introduced Senate Bill 1599 that aims to increase the unitary excise tax on tobacco products from P30 to P60 per pack, and the annual increase be raised from 4% to 9%. His goal is to parrot the goals of the Sin tax law of 2012 — more money for government, less smoking incidence by the people. Given the above numbers and facts on the ground, what the boxer-Senator would achieve if his bill becomes a law would be more illicit trade and more corruption in government while gaining more political pogi points for his political plans in 2022. Instead of introducing another round of higher sin tax, legislators and executive agencies should focus on strictly implementing the existing law and plug loopholes. The proliferation of counterfeit products and stamps mean there is proliferation of corruption in government that allowed such things to happen for several years. There is a limit to state nannyism and government intervention on how people should run their own lives. Government should limit its unlimited itch to tax-tax-tax, regulate-regulate-regulate, spend-spend-spend.